Emmanuelle Haïm’s debut disc of allegedly ‘Arcadian’ Duets (Virgin Veritas) was one of the most prominent Handel recordings released in 2002. It has already won many friends, and is now the apparent benchmark by which all recordings of Handel’s chamber duets must now be measured. Haïm’s success is partly due to the understandable attempts to avoid potential monotony in a disc full of chamber duets often containing similar sentiments and all accompanied by only a continuo section. This is certainly enhanced by her impressive roster of soloists including Natalie Dessay, Patricia Petibon, Véronique Gens, Sara Mingardo, Brian Asawa, Paul Agnew, and numerous other fashionable singers. Haïm’s ensemble Le Concert d’Astrée provides the singers colourful support, and the overall recording is far from dull. Indeed, it is so far towards the opposite extreme of dull that opinion has been sharply divided about it. One common criticism of Haïm’s fascinating disc is that her singers are uneven: while baroque specialists such as Sara Mingardo are captivating, other more apparently ‘versatile’ singers produce a sound that is not compatible with period instrument textures and lack the required agility and clarity that one expects from the best ‘early music’ performances. While nobody can doubt the luxuriousness of Haïm’s disc, it does not seem that all the singers blend in a manner that renders their egos subservient to Handel’s music. There can be no equivalent accusations of imbalance or idiosyncratic self-indulgence on this wonderful reissue by La Venexiana. Their concept of grouping together a certain category of Handel’s duets for soprano and alto is entirely successful, and justifies having this disc as both an alternative and a supplement to ‘Arcadian Duets’. The extensive documentation is a little long-winded, but is commendably thorough despite some extravagant statements. It is also attractively illustrated, and sheds plenty of light on both the repertoire and the philosophy behind these particular performances. It may be that the direct resonant style and prominent driving harpsichord employed by La Venexiana may not suit everybody, but Rossana Bertini and Claudio Cavina share the same appealing Latin spirit and declamatory emphasis as Haïm’s singers, and are more consistently aware of both each other and the direction Handel’s music is going in. They also use far less excessive vibrato and are much more judicious with ornamentation than Haïm’s guiltiest offenders. Neither singer suavely smoulders like their superiors on Haïm’s disc, and it is true that occasionally Cavina hoots his falsetto a little too much and Bertini can be harsh with her highest notes. Yet La Venexiana’s phrasing of the music and comprehension of the poetry is perfect, and eclipses the rough aspects of their intonation for this particular listener. The moderately reverberant recorded sound and immediacy of the singers highlights their flaws, but it also creates a genuine atmosphere of chamber performance. Perhaps in a perfect world we could have had Haïm’s singers controlled by Claudio Cavina, whose direction is utterly delightful, and not in the least part monotonous. Indeed, Cavina’s thoughtful and tasteful direction triumphantly demonstrates the abundance of wealth and variety in music that on paper is evidently formulaic and risks tedium. There are no dull moments, for these interpretations are alert, infectious, and irrepressibly fresh. La Venexiana’s recordings of Monteverdi (on the Glossa label) have brought them an enviable reputation as masters of the Italian madrigal since this disc of Handel duets was made six years ago. 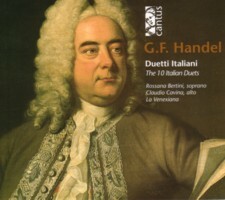 There are not many recordings of Handel’s chamber duets: I would not go so far as to suggest that La Venexiana’s disc is the best of a small bunch, but the currently available options do not get much better than their ravishing “Langue, geme”. It is refreshing that the ensemble is intent on beautification and refined theatrical expression rather than resorting to provocation or concentrating solely on flamboyant execution. Essential ingredients of these duets such as eroticism, tenderness, and playfulness are not diminished by an elegant and idiomatic approach.